Last weekend, the third edition of The Hague Rainbow Festival covered The Hague with rainbow flags. I joined the Pride Walk and other festivities, which I will describe in this blog. This fairly new Pride celebration in The Hague was a great combination of advocacy, sunshine, beautiful people, and fun entertainment. You can also find my vlog right below this image! In the Netherlands, more and more cities are deciding to throw their own Pride parties in addition to the big one we have in Amsterdam every year. As a result, we now also have Utrecht Pride and The Hague Rainbow Festival. This year, it was time for the third edition of The Hague Rainbow Festival, which was held at de Grote Markt. I absolutely adore the fact that my own city now has a pride, so I just had to be there. De Grote Markt, as the name says, is a big location but it is still only a single spot where the pride festivities take place. I hope this pride festival will grow over the next few years, so that the festivities take place across the city, increasing LGBTQ visibility in the city. That is why I am happy COC Haaglanden, the regional branch of our country’s biggest gay rights organization, hosted the second annual Pride Walk. With a Pride Walk, you effectively go from a static festival to a dynamic festival, raising awareness on the go. There was even talk about a canal parade like the one in Amsterdam but unfortunately, we have to wait a year (if all goes well – fingers crossed!). Look, I have been to the Dyke March in San Francisco. I know how cool and big you are. Still, walking the Pride Walk made me feel just as proud! Passing The Hague’s highlights, like the Peace Palace, with a big group of LGBTQ community members (of all ages! 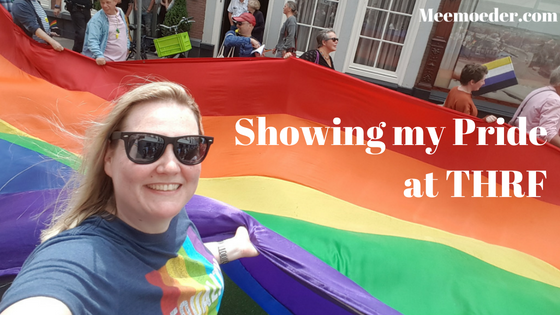 ), a brass band, a DJ, a gigantic rainbow flag, and more rainbow flags, and seeing people cheering us on along the way was a wonderful experience. Thank you, organization and volunteers, for making Pride Walk happen! The only thing that could have made this Pride Walk even more awesome was if my son had not decided it was time for an extended nap. Consequently, my wife and son had to miss out on Pride Walk. They joined me afterward at the Grote Markt. At around 4 pm, the Pride Walk arrived at the Grote Markt. The official opening of The Hague Rainbow Festival was at 5 pm. We had a few drinks and saw Sandra Khouw, our new Miss Gay Holland, being honored. After that, our son was getting hungry so we needed to head home for dinner. After our babysitter arrived, we were able to head back and join the festival again. You know what I love about these outdoor festivals? The fact that you can just stand somewhere with a beer in your hands, listening to live music, and friends and acquaintances can just join you and your group. Those friends and acquaintances, in turn, bring their own friends and acquaintances and so on and so on. Those are the best nights, right? She continues: “I was also very happy when I saw that people traveled to The Hague to support me when I was being honored as Miss Gay Holland 2018. It is truly fantastic to see how they appreciate it and are so happy that there is attention to them. That makes it worthwhile for me to dedicate my time and effort to our LGBTQ community. I love people the way they are.” Thanks, Sandra! I really hope The Hague Rainbow Festival continues to grow and that more people will join next year. I am happy that our country is seeing more and more pride festivals. How wonderful would it be if every region in The Netherlands had at least one? Think of the sense of community that could bring! PS I’m leaving for LOVE Fan Fest in Barcelona really soon. Subscribe to my YouTube channel to stay updated!